Shakyamuni Buddha was born in Nepal.Born in Lumbini of Nepal.Spend Twenty Nine yeras of his age in Hamsavatii royal palace Tilaurakot of Nepal.Married with Yoshodhara, the princess from Koliya kingdom of Devadaha of Nepal.After the enlightenment, he back to Tilaurakot to meet with his father and family and spend several days at Kudan where his father built Nyagrodharama stupa in Kudan of Nepal.After his death his ASTU or relics was put in different eight places.Seven places were dig and relics were distributed to several other places but Ramagram of Nepal is Only one place among eight, which is not dig after putting the relics of Buddha.So these places are the most important place and known as buddist Circuit in Nepal. Lumbini: Lumbini is the place where Lord Buddha was born. so Lumbini is very important holy destination for the buddhist fellow,disciple, researcher and student who want to know the buddhism in real way through the path of Buddha.Pink Mountain Treks and Expedition, Nepal's best Trek and tour agency is going to explain about Lumbini here in detail.we are introducing this trip, first time in Nepal as a Buddhist tour in Nepal, tour to Buddhist places in Nepal, travelling to important Buddhist pilgrimage in Nepal. In the Seventh and Sixth centuries BC Lumbini was a beautiful pleasure garden collectively maintained by the Shakyas of Kapilvastu(28 km a way from Lumbini) and Koliyas of Devadaha(38 km a way from Lumbini).The youth of the two republics, also nurtured contemplative and asesthetic values.Even the Buddha at the time of his Mahaparinirvana eloquently recommended from his deathbed at Kushinagara that all faithful followers and devotees of his order visit it.Lumbini was blessed with blooming sal trees and masses of beautiful flowers, and as a place where bees of five colours hum.the sweet warbling of various birds and other natural scenery in Lumbini was compared to the Chittalata(mind captivating) grove of Indra's paradise in heaven. At that time in Koliyas Kingdom of Ramagrama aka Devadaha, there was a king named with Anjana had a wife and her name was Rummindei(beautiful women).A rich householder had a pleasure grove that was place for recreation near Devadaha, the capital city of Koliyas.Queen Rummindei, liking that pleasant garden and wanting to own it, requested the king to grant it to her.it belonged to the householder and king denny to captured, but he assured her that he would make one even better then it in another place. A different garden was thus created in a place with perfect abundance of water, where there were varieties of fruits and many lotus flowers growing on land and in marshes-more even then were in the garden groves of the householder and meadows around it.Having been created for the Queen, it was nameed Rummindei.Later Rummindei was pronounced as Lummindei, and still later, as Lumbini. There was a king named Shuddhodan Gautma and Queen Named Mayadevi at Shakya Kingdom of Kapilvastu.Maya Devi, piously fasting,was observing the Shakya's celebration of Asadh Utsav,the bodhisattva enterned into her womb in the form of an elephant endowed with the six tusks,at Hamsavati Palace in Kapilvastu.The Great Sage Asita told that the queen had conceived a boy child in her womb and that this boy would became a Chakravati monarch if he led a domestic life or else would became a sage who would show the path of salvation the universe. Maya Devi, on nearing her ten month of pregnancy, wished to be at the base of a tree and gazing upon the pleasant garden-grove in Lumbini at the time of her child's delivery.On spring day,a royal procession with queen Maya Devi carrying the child in her womb, upon arrival, paused to rest in the lush garden of Lumbini.while standing spellbound before the natural gardeur of the garden, she began to feel the pangs of labour.Maya, just before giving birth to her son, bathed,walked twenty four paces north, and for support took hold of a drooping branch of the tree under which the buddha was to be born. Two springs of water,one hot and the other cold are said to have come down gracefully from the sky and washed the baby.the water of the spring collected and formed a pond.A pool of oily liquid also welled up from the ground nearby, and is said to have been used by the queen for cleaning herself after her delivery of the child. The royal entourage returned to Kapilvastu from Lumbini after first nurshing was over.Maya Devi passed away seven days after giving birth to the child.Great Sage Asita and his Brahmins team selected the name Siddhartha,which means 'he whose aim is accomplished'. Tilaurakot: Tilaurakot was the capital of the Shakya kingdom of Kapilvastu.Shakya king ruled the kingdom from the Hamsavati palace, which you can see even in these days also.Tilaurakot is 28 km west from Lumbini lies on the banks of the Bhagirathi(Banganga) river. According to Buddhist literary sources mention, read by Pink Mountain Treks and Expedition, Nepal's trek and tour agency's team underlined the lines that, the children banished from the Kosala kingdom established the city by the Nineth-Eightth centuries BC.The banished princes and princesses walked northward towards the foot of the himalayas.At about the same time Kapila Brahmin was practising penance at the sal forest on the slopes of the Himalayas besides a lotus pool.Upon his suggestion the banished princes cleared the Saka forest and build a city on the hermitage of sage Kapila and named it Kapilvastu after the name of the sage Kapila.There after they were known as Sakyas.The word Sakya mean 'of or belonging to the Saka tree'.The Saka is the tree known at present as sal (shorea robusta). Suddhodana, the father of enlightened ones, was became a king of Kapilvastu, after the 8th generation of the banished princes.Maya Devi was the name of his wife, princess from Koliyas Kingdom of Ramagrama aka Devadaha.Pink Mountain Treks and Expedition, Trek operator agency in Nepal already mention about the how Maya Devi conceived Buddha on her womb. Siddhartha was grow up in Tilaurakot royal palace.Sent to school and learn under Visvamitra.Was married to Yasodhara, the daughter of Dandapani, King of Devadaha at the age of 16.After his marriage, he was appointed Yuvraj and governer of a neighbouring town.He have a son, at his age of 29. In the midnight of Monday,Full moon and constellation, when he was Twenty Nine years old,Siddhartha accompanied his charioteer Channa, he left the palace riding on his favourite horse, Kanthaka, leaving his seven day old son Rahula and his lovely wife Yashodhara.He departed through the east gate of the city, called Mangala-Dwara or Lucky Gate and paused a short time beyond the gate to look back at the city, where these days we can find the stupa of Kanthaka's Return.Later, this eastern gate also come to be known as Mahabhiniskramana Dwara or the gate through which lord Buddha left his worldly life.Recent visit of Pink Mountain's team find lots of exavation is going on at Tilaurakot under the taking care of Archaeological department of Nepal.If you will be at there you can easily find the all the gates of old Palace and pool, pond and other rooms of the Buddha's father's palace. 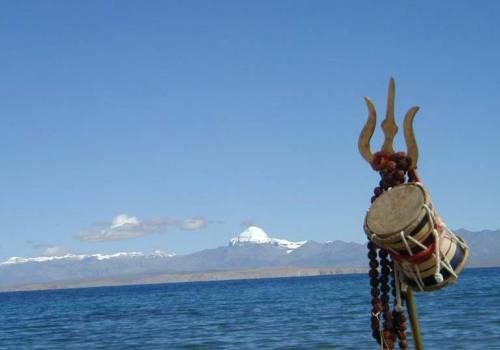 Nyagrodha: Nyagrodha or Nyagrodharama is also known as Kudan.Pink Mountain Treks and Expedition, which is operating trekking in Nepal, tour in Nepal, travels in Nepal, holidays in Nepal, which is prepare Buddhist circuit tour in Nepal is going to discribe about Nyagrodharama. The Buddha, who was respectfully known as TATHAGAT, had been away from Kapilvastu for more then seven years and had received no news of his family or friends during this time.King Suddhodana was overwhelmed with joy when he heard that his son, siddhartha, had attained Enlihtenment,he immediately sent the Buddha's Childhood friend Kaladayi and Channa to the bamboo forest monastery at Rajgriha, where Buddha was staying.The Buddha's heart was warmed by the news that his dear friends brought from Kapilvastu and replied–I will return to the Kapilvastu after the rainy season. when Suddhodana saw his son near to the street(was actually Nyagrodha's street) of the Kapilvastu, he steps walked toward the Buddha.The Buddha approached calmly and slowly to great his father. Nagasamala, fellow of Buddha, came and took the Buddha's begging bowl,enabling him to take hold of king 's hand.Tears streamed down the king's wrinkled cheeks as the Buddha gazed his father,his eyes filled with loving warmth.Suddhodana understood that Siddhartha was no longer the crown prince but a respected spritual teacher. Nine days after he had left Kapilvastu, Kaludayi had met the Buddha and the three hundred bhikkhus travelling with him.At the Kaludayi's suggestion, the king had built a monastery for the Buddha and Bhikkhus at Nyagrodharama park few miles southeast of Kapilvastu.It was there Buddha and the bhikkhus resided..Pink mountain Treks and Expedition,Nepal's best trip organizer find very beautiful and mind blowing architect on bricks of Nyagrodharama. Gautami(step mother of Buddha) and Yasodhara visited Buddha at Nyagrodharama.The Buddha stayed for fourty days at the Nyagrodha monestery during his first visit.This was the place where he met his father for the first time after his Enlightenment. Gotihawa: Gotihawa is one of the most important archaeological sites in Buddhist Circuit–Basanta Bidari, former chief of the Archaeological department of Nepal, told to Pink Mountain Treks and Expedition, which operate touristic activities in Nepal.This site lies about Seven kms south west of Tilaurakot and Two kms west to the Nyagrodharama and about Thirty one kms west of Lumbini.The whole area is littered with ancient pottery, bricks and brickbats.The site comprises mostly structures like stupas and monasteries.At the centre of the main mound lies an Asokan Pillar of which the upper portion has brokenoff and long since gone missing. This place is of special significance to Buddhist the world over.It is believed that the Kakruchhanda Buddha, One of the earlier Buddha before Shakyamuni Buddha, the twenty-second of the twenty four Buddhas, was born and attained nirvana in this holy place. Niglihawa: Niglihawa or Nigli sagar is situated nearly 8 kms north-east of Taulihawa and 32 kms north-west of Lumbini.It is a very important archaeological site in this region.It features a large manmade pool, which is commonly known as Nigali Sagar.Close to the pool lie two pieces of a broken Asokan pillar.The lower part o pillar is emerging in a slanted position from the ground. The upper part ormerly lay at the edge of the pool half sank in the water.It is believed that the Kanakmuni Buddha, one of the earlier Buddhas before Shakyamuni Buddha, the twenty third in the list of tweny four Buddhas was born, Enlightened and met his father in this place. Sagarhawa: To the north-west of the Tilaurakot, there are several hundred thousands of stupas, indicating the spot where the members o the Sakya tribe were slaughtered, is called Sagarhawa. Sagarhawa is located about 3 km north from Tilaurakot.Locally it is called Lambu(long) Sagar(pond).It is the site where the Sakyas were massacred.The ancient ruins are situated on the west and south banks of the large manmade pond.Virudhaka-raja, having subdued the Sakyas, and captured the members of their tribes to the numbers of 9990 myriads of people, then ordered them to be slaughtered.They piled their bodies like straw, and their blood was collected in lakes.The Devas moved the hreats of the men to collect their bones and bury them. Ramagrama: Ramagrama is located in Ramgram Municipality, in the Nawalparasi District of Nepal. 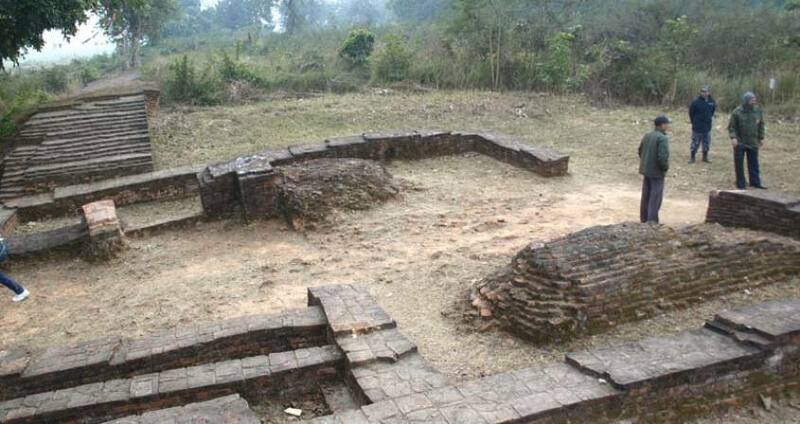 This Buddhist pilgrimage site, which was constructed some 2500 years BCE, contains relics of Gautama Buddha.According to Buddhist texts, after Buddha's Mahaparinirvana, his cremated remains were divided and distributed among the princes of eight of the sixteen mah?janapad?s. Each of the princes constructed a stupa at or near his capital city, within which the respective portion of the ashes was enshrined. To this day, Ramagrama stupa remains the only intact and original stupa containing relics of Lord Buddha. The stupa has been an object of great reverence and pilgrimage site since its original construction. The 7 metres (23 ft) high stupa is now buried under a mound of earth and is awaiting further research. Day 01:Arrival in Kathmandu.Meet with Pink Mountain Treks and Expedition's representative and proceed to Hotel. Day 02:Touring to Kathmandu, including Swayambhunath Stupa, Boudhanath Stupa and Pashpatinath Temple, roaming to the banks of bagmati river to realize the process of funeral of death body on cemetary site. Day 03:Drive to Pokhara through the scenic highway on the bank's of Trishuli, Marshyangdi and Madi river.overnight at Pokhara. Day 04:Touring to Pokhara, including world's peace pagoda, Davis falls, Jholungee bridge, Tibetan camp.Overnight at Pokhara. Day 05:Drive to Lumbini through most beautiful vegetation of the country.see the panaromic view's of the different mountain from different part of the highway. Day 06:Roaming to Lumbini sacred Garden.Visit different dozen's of Buddhist Monastery with Pink Mountain Treks and Expedition's highly knowledgeable guide about Lumbini.Overnight at Lumbini. Day 07:Drive to Tilaurakot-Nyagrodharama and Dhamnihawa twins stupa.Overnight in Taulihawa naer by Tilaurakot. Day 08:Touring to Gotihawa-Niglihawa and Sagarhawa.Drive back to Lumbini.Overnight at Lumbini. Day 09:Drive and touring to Ramagrama.Drive back to Lumbini.Overnight. Day 10:Drive or Fly back to Kathmandu.Stay overnight at Kathmandu. Day 11:Touring to Kathmandu and Bhaktapur Durbar square and shopping at Kathmandu.Overnight at Kathmandu. Day 12:Fly back to your Destination or can extend your staying. Day 1Arrival in Kathmandu.Meet with Pink Mountain Treks and Expedition's representative and proceed to Hotel. Day 2Touring to Kathmandu, including Swayambhunath Stupa, Boudhanath Stupa and Pashpatinath Temple, roaming to the banks of bagmati river to realize the process of funeral of death body on cemetary site. Day 3Drive to Pokhara through the scenic highway on the bank's of Trishuli, Marshyangdi and Madi river.overnight at Pokhara. Day 4Touring to Pokhara, including world's peace pagoda, Davis falls, Jholungee bridge, Tibetan camp.Overnight at Pokhara. Day 5Drive to Lumbini through most beautiful vegetation of the country.see the panaromic view's of the different mountain from different part of the highway. Day 6Roaming to Lumbini sacred Garden.Visit different dozen's of Buddhist Monastery with Pink Mountain Treks and Expedition's highly knowledgeable guide about Lumbini.Overnight at Lumbini. Day 7Drive to Tilaurakot-Nyagrodharama and Dhamnihawa twins stupa.Overnight in Taulihawa naer by Tilaurakot. Day 8Touring to Gotihawa-Niglihawa and Sagarhawa.Drive back to Lumbini.Overnight at Lumbini. You can extend your staying in Lumbini more days for meditation and yoga on peace place of the world to discover your inner peace. Day 10Drive or Fly back to Kathmandu.Stay overnight at Kathmandu. Day 11Touring to Kathmandu and Bhaktapur Durbar square and shopping at Kathmandu.Overnight at Kathmandu. Day 12Fly back to your Destination or can extend your staying.